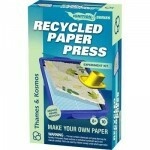 Recycle your scrap paper, old newspapers and tissue paper into beautiful hand-crafted paper. Start with a slurry of paper pulp, drain it in the sieve tray, then press it flat with a special tool. 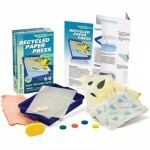 Experiment with different paper fibers and add pigment tablets to change the color of your paper. Learn why recycling used materials into new ones is a crucial and growing practice around the world. Includes a 12 page Manual.